In 1936 the U.S. Department of Agriculture began construction on three new communities, known as Greenbelt Towns, as a part of President Roosevelt's New Deal. One of them, Greendale, was built in Wisconsin, about three miles southwest of Milwaukee. Built to demonstrate a new kind of suburban living, these towns were built so that housing was situated within easy walking distance of gardens, employment and the town center. This gallery consists of more than 190 images taken by prominent community member Raymond Miller. Many photos are from the first few years of the village and include early plans for facilities, aerial photos and construction of buildings. There are also images of the social development of the community itself, including ice skaters, children at play, the library, a Fourth of July parade, a Civilian Defense rally, and many more scenes of late 1930s and early 1940s Americana. With the purchase of 3,400 acres of farmland near Milwaukee, the Department of Agriculture's Resettlement Administration had three main objectives for the area: to demonstrate a new kind of suburban community planning that would combine the advantages of both city and country life; to provide good housing at reasonable prices for moderate income families; and to provide jobs to thousands of unemployed workers. Greendale was one of three Greenbelt communities, complete, readymade towns constructed in Greenbelt, Maryland (near Washington, D.C.), Greenhills, Ohio (north of Cincinnati), and here in Wisconsin. Construction began on Greendale in July 1936, and, despite a movers strike, the first courageous families moved in on April 30, 1938. The original downtown included a Village Hall, several businesses, and 572 living units in 366 buildings, each with an average of 5,000 square feet of space for lawns and gardens. The village included a tavern, movie theater, volunteer fire station, newspaper office (The Greendale Review), schools, cooperative market and beautiful stone carvings by Alonzo Hauser. All of the property was owned by the government and then rented to families, based on income, housing need and family size. Income requirements were specific: a minimum annual income of $1,200 and a maximum of $2,700. Some exceptions were made for those with special skills such as medical doctors and other professionals. 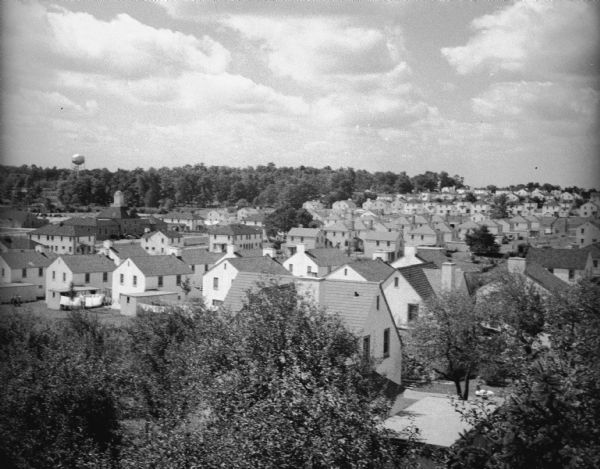 To prevent too rapid expansion, all new development was tightly controlled by Greendale residents through various homeowners associations, as well as the green belt of parkways surrounding the village. In 1949 the Public Housing Administration gave Greendale residents the right to purchase their homes from the government. The transfer of ownership from the government to the people was largely complete by 1952.